Guillaume was born November 24, 1827 in the town of St-Jean-Baptiste, of Quebec, Canada. His parents were Guillaume Saurette and Apolline Archambault. He married Elmire Jourdain-Lafrance February 27, 1854 in St-Jean-Baptiste, Rouville, Quebec, Canada. Guillaume died on March 10th, 1921 in Montreal and was buried on March 12th in the Cimetiere de l’Est, Montreal, Quebec, Canada. View Guillaume’s family report here. Take a look at the marriage certificate as recorded in the parish of Saint-Jean-Baptiste. Due to the lack of records that I have searched, my knowledge level about the Saurette’s from this point back in time is only in bits and pieces. 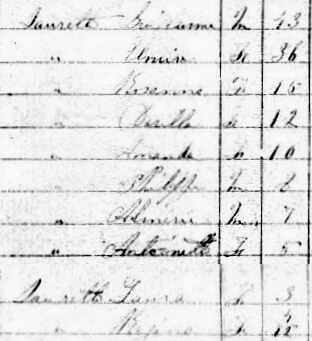 Guillaume and his family were found in the 1871 census of Canada living in St-Jean-Baptiste. Guillaume and his family were found in the 1881 census of Canada living in St-Jean-Baptiste. In the 1891 Canadian Census, Guillaume and his wife, Elmire, were living with their son Philippe and his family in St-Jean-Baptiste. According to the Canadian Census of 1901, they were found to be living with his son, Almeric, again, in St-Jean-Baptiste. 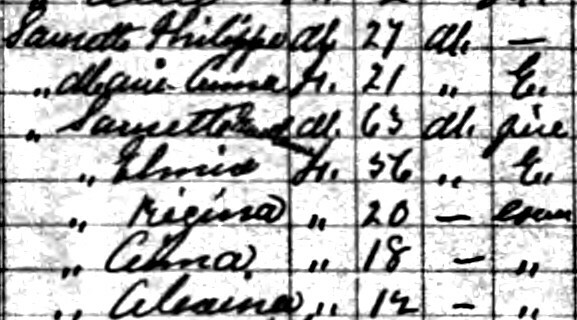 I found Guillaume in the 1911 Canadian Census as well. He is living as a border in the house next to his son, Philippe. Of note is the location in this census. Philippe and his father were now living in Ste-Brigide, Iberville. This is the first time he is away from St-Jean-Baptiste. His name is down near the bottom of the image. His wife had passed away in 1909. 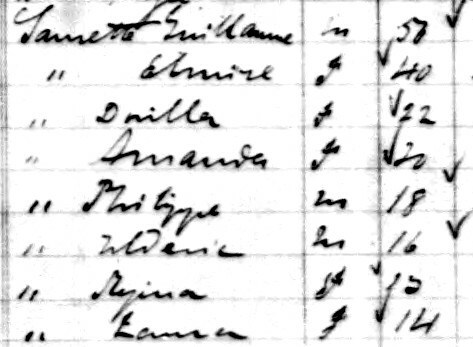 I’m am 100% certain that Guillaume and his family stayed in Canada, as it appears that his son, Almeric, was the first of my direct Saurette line to immigrate to the United States. Guillaume had a brother, Jean-Baptiste Saurette. He married twice and had a bunch of children. I’m including a photo of his headstone at the bottom of this enty to show that he, also, has the Saurette surname only. I know that Guillaume and Elmire had 12 children. 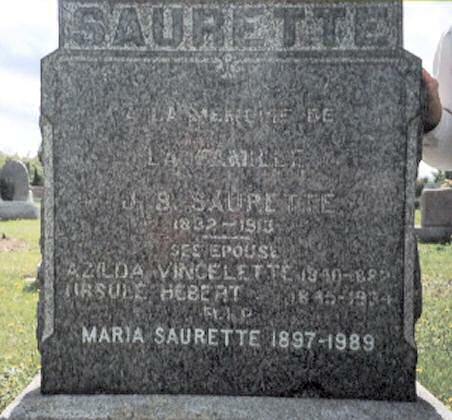 Of these, there were only two sons – that would make the Saurette name not very common in the United States. There may still be related Saurettes to me in the United States, but I have yet to unearth them.